Encouraging you to become all God envisioned so you can experience what God S.A.W.W. (Spiritual Abundance Wholeness & Wealth). 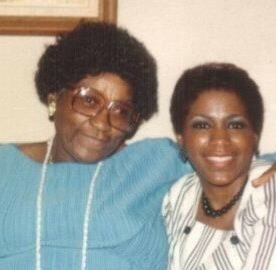 More often than not I’m reminded of my mother simply because I look so much like her. I gaze into the mirror and I see her. I look down at my hands and I see her hands. My thighs resemble her thighs. Yes, my walk, especially when I don’t intentionally sashay across the room, is her walk tethering from side-to-side. Not only do I see her in me, I see her in my siblings as well. I see her in my nieces and nephews even those who never had the great opportunity to meet her. Unfortunately and fortunately, my Mother has made her transition from this world to that of her Father’s. The impact she made continues to have far-reaching effects into generations yet to be born. I remember after my Mother made her transition, I found a steno notebook where she had written, “Lord please make my life count.” Wow! Didn’t she know how much her life counted? All I could think of is the impact she had made on my life, my siblings, my friends and countless others that I may never know about. Yet, she had written those words, I suspect, at a time when she queried God about her purpose on this earth. I can remember the numerous times I wrote letters to her while living in Washington DC about my undying commitment, gratitude and love for her just for simply being my Mother. I knew as I wrote them that her proudest moment would come when they were read at the church as they honored mothers. I wasn’t always there, but I wanted everyone to know what she meant to me and how much she impacted my life and others. Even in her life anew with her Father, the impact is even more pronounced. I often wish she was here with me to see that all of what she poured into me and sacrificed for me was not in vain. It has and continues to manifest its purpose. The more I mature in Christ, the more I realize she exhibited a quiet confidence of liberty and freedom in her relationship with God. It is because of this I am able to embrace Him with total abandonment and liberation. Oftentimes I wish I can still express to her just how much her life counted. It is rewarding to me when I speak with siblings and each of us have not only our shared moments, but our unique memories of her impact our lives. We celebrate each and every day when we embrace and live out the legacy she passed to each of us. It was and continues to be a legacy of love and commitment to family. It is a huge responsibility, but one in which we all have embraced. That is why we get together so frequently. That is why we pray together every Saturday morning. That is why we love each other no matter what. That is why no one will allow another to pull away. We are committed to her legacy. As you celebrate this Mother’s Day, cherish all that your mother poured into you. Even if all you can cherish is that she birthed you into this world, honor her for it. Mother’s are special people who should always know that their lives count and their legacy continues. If you don’t believe me just gaze into the mirror. You see…you’re a living testament of that fact. When I was about 8-years old I went to visit my father and his relatives. When I came home and was standing in front of my house I realized that just because they were no longer in my presence, they still were alive. It was one of those moments in the maturation process when you realize that the world was bigger than you. Up until that point, my mindset had not developed to realize that life was more than the block I lived on, the church and school I attended, and my family. In the finiteness of my mind, I probably thought everything stood still until I came into its presence. It was in that moment that I realized that there was more to this world than just my life. It was vast. More than I ever would be able to comprehend. Oftentimes I ponder about that moment. I realize that it was in that instance my horizons expanded and I begin to embrace the expansiveness of God. Not long after that, my father took us on a trip to Washington DC. I ventured out of my comfort zone and went to a place I had barely recalled learning about in school. Yet, all it took was my Father taking us on a trip letting us know that there was more for us. Unfortunately there are people who have self-imposed limitations. Although God continues to try to enlarge them, they elect to remain in the finite existence that prohibits them from experiencing the vast world God has for them. They have self-imposed geographic boundaries and refuse to venture beyond a certain point. There are those who are victims. Everything and everyone stops them from progressing. 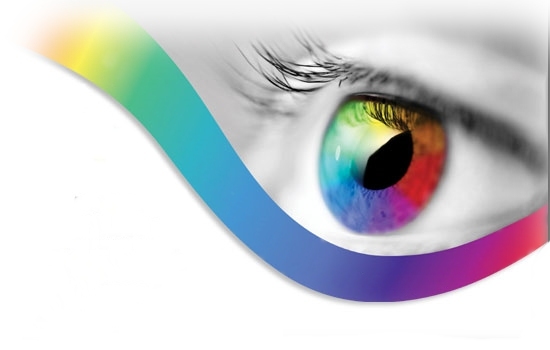 They hide behind superficial barriers such as gender, age, poverty and yes color. All the while giving someone else control over their destiny and piling up a heap of excuses for not succeeding. Excuses are like lying to yourself repeatedly. You tell yourself what you can’t do and the more you say those words the more you believe them. Oh they are such lies! These are the deceptive words that prevent you from envisioning the great things God wants you to experience and become. I often say a lot about my Mother and not much about my Father. My Mother was the center of my life. She was my rock and instilled in us the value of unconditional love. She was the one who made the sacrifices and who believed in me. Although my Father was not always there, he did expose us to things like the trip to Washington DC that let us know that the world was bigger than just Detroit. We were not limited to our geographic surroundings. Eventually I actually moved to Washington DC. What if I allowed fear to prevent me from going? I remember wanting my Mother to say don’t go. But she wisely said, “Jacqui, many of them think that you are going to be back here in six months. Prove them wrong.” At the time I thought that was the wrong answer. It wasn’t. It was the best answer she could have given me. That answer liberated me. When things were a little rough the first several months I was in Washington DC, again I went to my mother and wanted her to say come home. Once again she unselfishly said, “Yes, I want you to come home, but not unless you have something better.” Wow! Those words propelled me to not give up and run home. It caused me to expand and to grow. Each of my parents has played a role in my success and my overcoming the barriers of fear and doubt that would have kept me from exploring and experiencing an abundant life. You know, God, our Father, wants the same thing for each of us. He wants us to be expansive and not to be afraid of anything or anxious about venturing beyond our comfort zone. He definitely does not want us to allow the barriers of this world to prevent us from experiencing an abundantly full life in this vast world of opportunity. 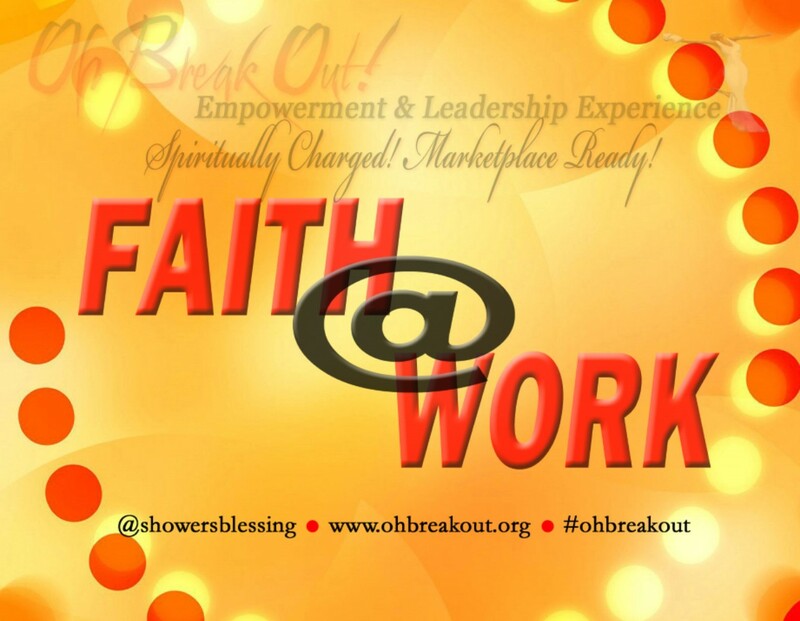 REGISTER FOR OH BREAK OUT EMPOWERMENT & LEADERSHIP EXPERIENCE @ http://www.ohbreakout.org! Father, I realize there is much more for me. 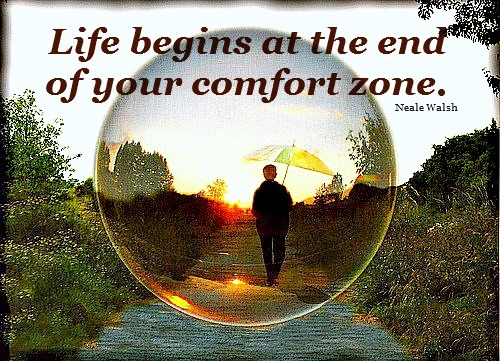 I will not be afraid to venture beyond my comfort zone. When I do my boundaries are enlarged—not just geographically, but the boundaries of limitations in my mind. Each day I realize You are doing exceeding beyond my loftiest imaginations. I believe beyond belief that I can have whatever You say I can have in this vast world of opportunities Amen. 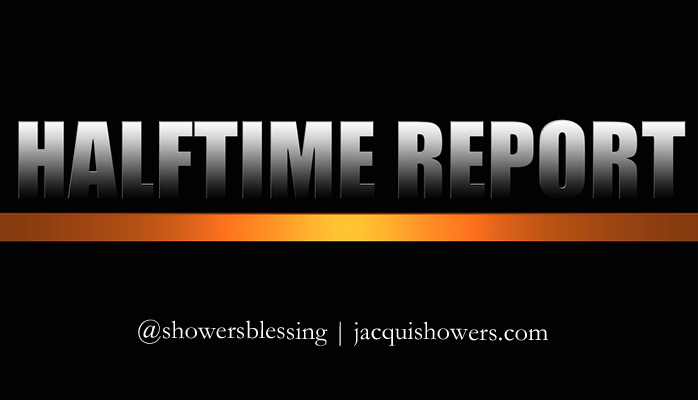 Why do you think companies spend enormous amounts of money on advertising during the half time report of any sporting event? Because they know people want a detailed analysis of the first half as they anticipate the second. The first half of the game provides insight as to how the second half is projected to go. Keep in mind that it is only a projection and they really don’t have the final say. So it is the same with us. We are at the half way mark of this year. Just like the sports pundits, we make an assessment of how effective we have been in accomplishing our goals the first half of the year. Similar to the pundits, there is a finite amount of information we have in order for us to make that assessment. We can only view it from our vantage point. You see, the sports pundits go by what their eyes can see. They don’t know all the information. Back in the locker room each team is assessing the first half of the game. They are establishing new strategies to win from their analysis and their vantage point. As they analyze the first half, they adjust their strategy to alleviate obstacles that prevented them from being successful. The sportscasters covering the game are not privy to these adjustments. They can speculate, but they don’t have all the facts. You are the same way. The forces of this world trying to prevent you from accomplishing your goals have limited perception. However, as you and God meet in the locker room you all are developing a new strategy for you to win. Only you and God know what is happening in that locker room. God’s report supersedes any half time report of the forces of the air. Howbeit, you still have to do something. In the locker room of prayer and meditation, God is providing you with the play book. It is up to you to execute the plays. Just like professional athletes who have exceptional prowess as some of the best in the world, each of us have been endowed with exceptional abilities when we follow the instructions of our Coach. Each player is on the field playing the game. Their vantage point is different from the coach’s. The coach can see the play of everyone, but each player is focused primarily on their position. The coach doesn’t just analyze the game, but the crowd as well. So the coach knows that if you don’t get the crowd out of the game, you can lose because of the negative chants from the opposing team’s fans that can get in the head of his players. The coach knows that when you go out for the second half of the game, the cacophonous noise from the crowd has to be silenced. You need a big score! This win will silence the loudest crowd. It doesn’t matter if you are in a sports arena or the arenas of your mind, those negative voices are pivotal to your success or failure. How are you going to silence them? You got it! You are going to score big! Wow! You have taken the crowd of negativity out of the game! You’re gaining momentum as you propel through the second half and win it all! What are your goals for the second half of the year? Have you taken time to assess what worked, what didn’t and what new goals and strategies you have for the second half? Father, I’m in the second half of this year. So many negative voices are trying to dissuade me not to keep moving forward. In the first half, I didn’t do all I had intended, but as I listen to You I will be able to silence those cacophonous voices by making one big score after another. When the year comes to a close, I will look back and know that when I came out for the second half I scored big time after time. I won’t look back because I have been propelled to succeed regardless of the negative report of the first half. Your report is the only one I believe! Your report forecasts nothing but success! Amen. While attending an orientation the facilitator stated that if you are on a job site and asked to pray you are not to pray because of separation of church and state. I was intrigued by the statement and it took me back to when I worked with the U.S. Census mobilizing the faith-based community during the Decennial 2010 Census. During my tenure with the Census it became apparent that they were highly dependent upon the faith-based organizations to disseminate the importance for every U.S. citizen to be counted. It was interesting that separation of church and state was not a concern, at least when they needed the faith-based organizations to help them. As I listened to the facilitator make such a declarative statement without wincing about not praying in the workplace, I couldn’t help but wonder about my constitutional rights as a U.S. citizen. What happened to our constitutional rights of freedom of religion, assembling and speech? It appeared as though my freedoms were being infringed upon as I was being told not to willing take part in a practice that is second nature to who I am. I am always intrigued how our society feels nothing about dictating the actions of believers, especially how it relates to faith and the workplace. Yet, the government clearly does not exercise that same practice when they need to get their message out and mobilize the community around an initiative that is important to them such as making sure every American is counted. In essence, as long as it is beneficial for them it is okay for church and state to comingle, but when it is the church or a believer initiating that action there is an issue. Now, don’t get me wrong I am not some rebel, but I am always intrigued about the expectation that as believers we can turn our faith on and off. In essence, practice your belief on Sunday, but when Monday comes don’t bring it to work with you. How ludicrous does that sound? Our faith is not some dress that you wear on Sunday, take it off and hang it up until the next Sunday. It is an integral part of who we are and what we believe. To be asked not to exercise our freedoms as Americans is an atrocity. In essence, you cannot saw us in two on Monday morning and leave our faith and our beliefs at home. God has strategically placed each of us in careers and jobs to be influencers. That is not to say we walk around speaking in unknown tongues or crying out hallelujah to everything said. It does mean we are to be bright lights in the marketplace. It does mean we are to walk circumspect according to our calling by God and not by the vocation of man. I am not in agreement with those who practice lip service of their commitment to God, but their actions are far from what is intended. I do believe I have a God-given right and an American right to practice my belief—including willingly praying in a work environment. We move seamlessly from Sunday to Monday without much thought about it. I have spoken to many who experience trepidation to exercise their faith at work because of the perceived notion of separation of church and state disregarding their constitutional right to freedom of speech, religion and assembling. If a group of individuals have determined that they want to come together and pray they have that right. Father, I adhere to the laws of the land as long as they do not conflict with Your statutes. I understand that you have instructed us to be law-abiding citizens because You created the governments and put the leaders in place. I also realize I have the right to exercise my freedoms of speech, religion and assembling with like-minded believers. I will not forsake assembling with them because of the perceived notion of separation and state. I will adhere to the laws of the land and even more to Your Word as You have strategically placed me in the marketplace to be a bright light. Amen. My brother said, “Why would anybody follow Jacqui? She doesn’t know anything!” In his mind it didn’t make sense to follow his little sister whom he deemed as having no influence. Why in the world would almost a whole school heed her command to walk out of school at a certain time in protest that girls should be able to wear halters? I recall at the beginning of the school year teachers went on a strike forcing us to stay in school a few weeks longer. It was hot! In some parts of Finney High School there was no air conditioning. It was quite basic to me because we hadn’t gone on strike so why in the world should we suffer. Walla! We should be able to dress the way we would if we were out of school like we were supposed to be. Yes, others felt the same way and joined the protest. At a certain time as was instructed, everyone gathered in front of the office and took their jackets off exposing their halters. We were chanting, “We want halters! We want halters! We want halters!” It was epic! I couldn’t believe it truly happened just because I said so. What influence! Needless to say I got suspended from school and our parents had to accompany us back. What followed was a meeting between the students and parents. Because my mother was tired of traipsing up to the school, she decided to let my father take me. What a novel idea! He was a pushover. Where my mother probably would have said be quiet when I spoke, my father felt I was right. What we realized is that our school did not have a dress code against wearing halters. We did win the right to wear halters that year and every year thereafter. Influence is a great responsibility. How you use your influence carries a tremendous amount of weight. As believers we have to understand that God has given us influence to effect the world…the marketplace. Each of us have been placed in our respective vocations to influence society. There are seven pillars—family, religion, education, media, government, arts and entertainment, and business—that governs our lives. God expects us to influence them for His greater good. If at the tender age of 16 I could mobilize an entire school to walk out in protest that we couldn’t wear halters, how much more can I do now. How much more can you do? We have a mandate to fulfill the great commission. We are influencers! I realized early I am an influencer. I was a rebel without a cause, but now I have a cause. That cause is to empower you to be the influencer God envisioned. Oh Break Out Empowerment & Leadership Experience is one of the venues in which I fulfill my mandate. I realize this is the 21st century mission field and each of us must be able to seamlessly move from our place of worship on Sunday to the marketplace on Monday—where we spend the bulk of our lives. In essence, to move beyond the four walls of worship into the wall-lessness of service and influence. BE AN INFLUENCER! 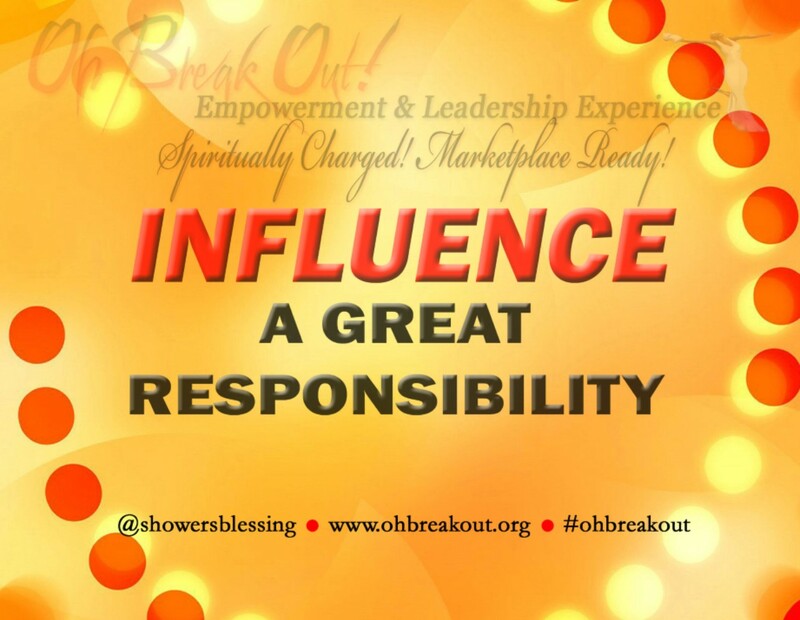 @ Oh Break Out Empowerment & Leadership Experience REGISTER NOW! Father, You have created me to be an influencer. I am positive influence everywhere I go. I do have a cause to fulfill the mandate of the great commission in the earth realm. You have given me influence in order for me to a shining light that cannot be hidden as I influence others to become all You created them to be. Amen. Now some may say, “How in the world could you not see a cup laying on the floor that you would almost trip over it?” Well, it’s easy not to see something that is not important to you. Take it from someone who for years could not see a cup on the floor. You see, until something becomes important to you, you don’t see it. It didn’t matter to me if that coat was on the floor. I simply walked around it or stepped over it. It could have stayed there forever for all I cared. Like anything else in life, until something becomes important to you, you can’t see it. This includes your own success. Until you can see yourself being successful, you will never be successful. Countless people can talk to you about success, but you will never experience it. Why? Because you cannot envision yourself being successful. It is as simple as that! It is no difference than when my niece did not see that cup. She simply stepped over it. Many simply step over opportunities because they can’t perceive them as opportunities. They wonder why is it they are at the same place every year, not dreaming of success, but just thinking about it. You can think about something, but if you never truly envision it, you will never do anything to achieve it. All of those dreams and aspirations will remain on that floor waiting for you to pick them up and do something. Hopefully, your eyes of enlightenment will be opened for you to see that you have been blind to your own success. Every opportunity that has come your way you have simply stepped over them. There comes a time when you have to open your eyes and you have to see yourself being successful. If not, your dreams will remain on the floor as you continue to step over them year-after -year. SEE YOUR SUCCESS! Contact me for a personal coaching session @ The ME Place. Father, Open my eyes to see all of the dreams You have for me. I will no longer be blind to my own success causing me to pass over opportunities repeatedly, but I will envision my success and every opportunity that comes my way I will take advantage of them. Thank you for enabling me to not only envision my dreams, but to see and achieve them. Amen. 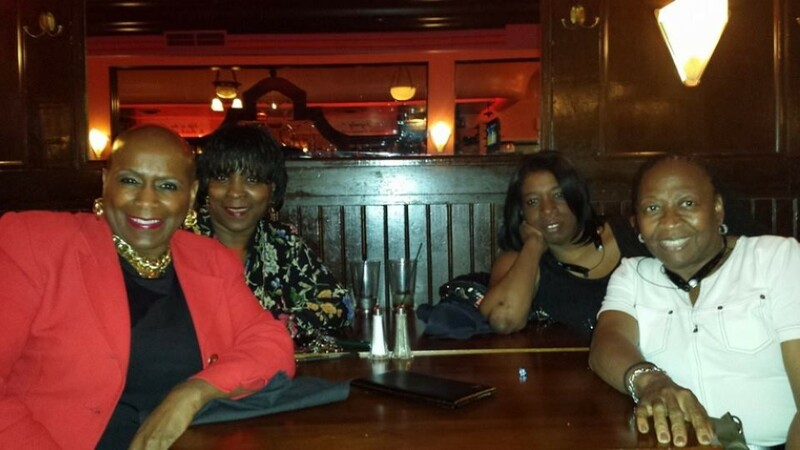 Celebrating my birthday with family and friends. Birthdays come and birthdays go, but there are those birthdays that have significant meanings. You will always remember them for one reason or another. Sometimes it doesn’t have as much to do with the festivities surrounding them as much as it has to do with what is happening in your life at that time. My birthday of 2013 will always resonate with me because on that day I attended the viewing and family hour of my beloved sister and best friend. I can recant almost hour-by-hour exactly what I was doing last year. This year there were times when I gazed at the time and would ponder in my spirit exactly what I was doing a year ago. That birthday is forever etched in my mind because of the tremendous loss I experienced. This year’s birthday memories will be because of the many birthday blessings and outpour of love I received. When I woke up that morning I had no idea what would confront me. I remember experiencing a certain amount of sadness because my sister would always call me first thing in the morning. Suddenly my phone rang, no it was not her. I don’t know what I would have done if it had been. I may not be writing this blog because I would have died of fright…excitement or both. At any rate, at that precise moment the telephone rang. It was a dear friend calling to say Happy Birthday. Instantly my spirits began to lift and before the day was over and after hundreds of birthday blessings coming from everywhere—Facebook, LinkedIn, text messages and telephone calls, not to mention having my daughter-like and my grandbabies-like surprise me with a birthday cake as well as sharing a birthday meal with family and friends—I was more than okay. I was exuberant! As the day came to a close, I realized how blessed I really am and just how much God loves me. God gives us the desires of our hearts and He knew that my desire was that I wanted to celebrate my birthday without the grief of last year hovering over it. That is not to say I didn’t think about my beloved sister, but it is to say that whenever I would think about her it was with joy resonating in my spirit and I am happy for her. The best gift of all was the overwhelming happiness and joy God gave me as I celebrated yet another blessed year of His precious gift of life. He gave me beauty for ashes, joy for mourning and a garment of praise for a spirit of heaviness. What more can I ask for? SAY YES TO YOUR SUCCESS! Contact me for a personal coaching session @ The ME Place. Father, Thank you for an awesome birthday that I remember for years to come. I thank You for the many people who took time to share in my birthday with me. I pray they will be abundantly blessed. Most of all I thank You for Your overflowing happiness and joy! Amen. It doesn’t seem possible it’s been one year since my beloved sister and best friend made her transition, but it was one year ago today. It reminded me of when my Uncle Joe passed away and my mother expressed how they had never been apart except for when he went away to the Army. In some respects, that is what it had been for me and Patricia. Although she had gone away for stints in the army including Desert Storm and we lived apart when she moved back to Detroit and I remained in Washington D.C., we were always able to communicate with each other. This past year has been a huge adjustment not being able to just talk with her. A small voice whispered in my spirit yesterday, “Be happy for me!” I remember thinking about it at the time and saying. I am happy for you, but there is a certain amount of melancholy associated with my happiness. 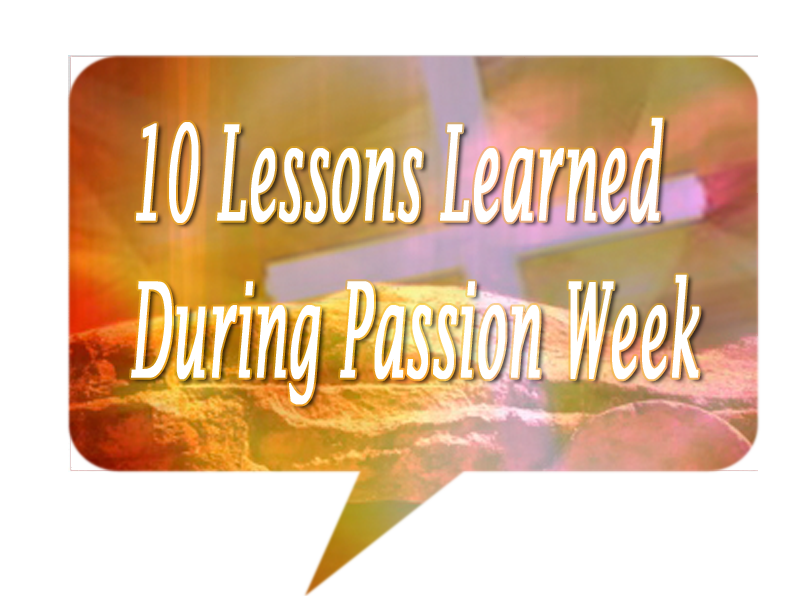 You see, prior to Patricia’s first death in 2004 when God brought her back to life, we had a conversation about a belief she had that went awry with God’s Word. She was quite adamant and so was I in our beliefs. We never discussed it again until several years later. Interestingly enough Patricia’s belief system had aligned itself with God’s. By the time of her second death when God called her home to be with Him, she had become the person God created her to be. After her transition as I was going through her text messages it was text after text where she was ministering to family and friends. In essence she had intimately come to not only know God and His desires, but she was ministering them to others as well. I was overjoyed! I knew she was with God! The natural side of me lost my sister and my best friend. That is the part that sometimes will experience sadness. Not as much as I had, but I still have my moments when I wish she was still here with me to share, and yes to shop, as we had done so many times. It was hard moving forward knowing that she wasn’t here anymore. Yet, I haven’t made her into her a martyr either. I still remember how she would slap my head and holler, “Go comb your hair!” I remember when we would be out at a club or anywhere and she would say, “Look at that phony smile of Jacqui’s.” I haven’t forgotten how she leaned over the banister and put paint in my hair or as I walked up the stairs she pulled my leg from under me so I would fall. Or when she took my notebook and threw all of my study notes out in the rain. I must be a little crazy pining over someone who treated me like that! What in the world is wrong with me? It is called sisterhood…it is called friendship. Along the way, she did great things for me as well. She was my most ardent supporter in all the things I did, especially my ministry. Patricia more than any other sibling taught me many practical life skills—really I had no choice but to learn them. Yes I miss her, but I’m happy because she embraced the true meaning for living. Tomorrow we will celebrate and remember the day she was born into this world, but the joy that wells up in the essence of my being is knowing that because of her life she has an eternal birthday. Today I can be happy because on May 14, 2013 she birthed into eternity to be with her Father, Almighty God, forever. Father, Father, Life is a gift, but the greatest is eternal life. Although I may miss my sister, I am overjoyed in knowing that she will be eternally with You. Bless me, my family, my friends and others to live a life so when our time comes we will live forever with You as well. Amen. 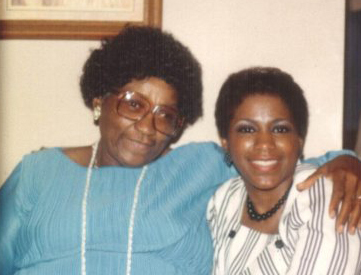 I received a text saying, “I am so missing my mother.” It made me think about mothers and what they are in our lives. Oftentimes our mothers are taken for granted. We have this notion that they will be with us forever, in some respects they will be. A day will come, as it has for that person and me, when your Mother will make her transition. Before that happens I implore upon you to make time for your Mother. Initially when I moved to Washington D.C. and would come back home for a visit, I would spend my entire time trying to see all of my friends. From the time I hit the city until I dashed off to the airport to catch my plane, I was consumed with being with making sure I made contact with everyone. Then it dawned on me. My mother was getting older. I had no idea how long she would be around and I wanted to spend as much time as I possibly could with her. Instead of running to see this one and that one, I spent the bulk of my time with my Mother. Along the way I didn’t have as many friends, because I realized I was running to them and they were not flocking to see me. The time I spent when I came back home with my Mother was priceless. When she took her last breath I knew that I had given her as much of me as I possibly could. Nothing could recompense my Mother for all that she had done for me, but I could give back by just being with her. In many instances, that is what our mothers want. They want our presence. Your presence is the best present that you can give your mother. If your mother is still here give her the best gift—give her you! That is really all she wants. And I will make them and the places round about my hill a blessing; and I will cause the shower to come down in his season; there shall be showers of blessing. Jacqui ShowersYou have an awesome day as well.